Learn some everyday in this Web, many interesting and useful contents. Computer, definition, technologies y compatibility. What is software and hardware?. Computer security, not having virus. This reading in Spanish: (Esta lectura en español) ¿Qué es un Sistema Operativo?.. Go to: Computer repair course. What is a Operating System? What is exactly an Operating System? An OS is a program manager; also contains files that use these to function. An OS is essential in a PC, acts as an intermediary between the user and the hardware components. The most widespread is the Microsoft Windows Operating System. There are some another, among which stands out the Linux operating system that has different distributions being some totally free and some another with cost. There are also the excellent systems: Operating System and UNIX ® Operating System Apple Mac OS X. Components similar to a computer such as modern cellulars and tablets also have a specific Operating System, for example Android which is based on Linux. It's noteworthy that from Linux exist several distributions of different costs, there are from free to some with a similar cost to other systems. About the security level and stability in general, many choose Linux OS, but could exist a driver or program that doesn't you obtain for this system or could be difficult their correct installation. Also in general, for a totally inexperienced user Linux is more complicated, unlike a truly advanced user, who could even to adapt the Linux OS to different tasks and environments, issue that could not be made with other operating systems not so flexible. 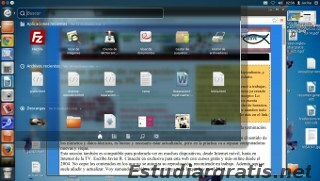 - A Operating System is part of the function of boot (the boot are all the steps that realizes the PC before being functional).
. - It's the graphical user interface (GUI) that are the windows, buttons, etc -Estudiargratis.net the web to study for free-. That is, the set of codes and instructions that make it up, providing an ease for the use of hardware through various programs included or not. - It recognizes the components that has the PC. The Operating System with the Drivers of the components makes these can be used. For example: Microsoft Windows Operating System detects a Sound Card, then is installed its corresponding driver and it will be ready to listen music through a program such as Windows Media Player or Winamp, through a speakers connected to the plate Sound. Any component of computer needs a Driver, for at least one predetermined by the OS (Operating System abbreviation). Image, Operating System based on Linux, Ubuntu, it has been pressed into his home button . First shows the most used applications, has a search engine, and also shows the recently opened files. - It provides different files such .dll Windows (dynamic libraries), which are routines of instructions and other files, from which it needs different applications to be able to function (that is why not all software is compatible with all OS, or with the version from a same SO).
. - It manages interruption ports to give priority to a program or another; to execution of an instruction or another, by the microprocessor, etc. - It manages Memory. It uploads multiple files in it and administers what is called Virtual Memory, which is an extension of Main Memory of System but using the Hard Disk. It low the performance when using, but this way you can continue working if there is no more Main Memory of System available. This work is done in combination with the Microprocessor. - Other functions have a wide compatibility with Internet and with various multimedia devices such as digital cameras, CD Writers, Web Cameras, etc. All these are the functions of OS. It isn't an ordinary program administrator or another common program, is all a basis for allow the compatible software works properly and the user can interact with the computer, hence its importance. It's useless to have with oneself the most powerful of computers, if in this one there is nothing or not has been programmed to perform a specific task. Software (programs) and hardware (machine) are equally important. Did you know that the computer repair course is expanded or is updated to new edition continually?